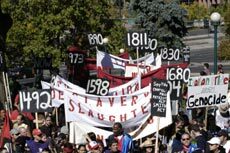 This year’s Columbus Day parade marched on despite the pleas and efforts of the American Indian Movement (AIM) to eliminate the event. 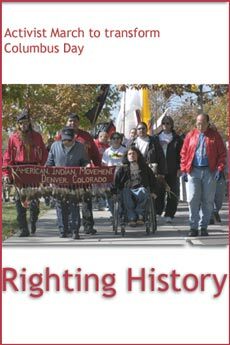 AIM stands firmly against the parade, claiming Columbus committed genocide, participated in the slave trade, and started a legacy of imperialism and racism that was responsible for the decimation of entire Indian populations — a legacy that still exists. Firm supporters of the parade, The Sons of Italy claim Columbus was a magnificent explorer who was the first European to establish a colony in America, bringing Judeo-Christian values to the New World. The invitation was presented at 22nd and Blake streets, in the middle of the Columbus Day Parade. Both sides were separated by a block, and 23 police in riot gear guarded each side. 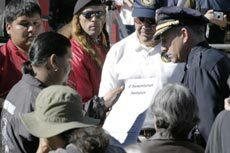 Richard Castaldo, an Italian American and MSCD student, and Wallace Black Elk, an AIM elder, approached the police line accompanied by numerous community members. The invitation was given to a police officer who then handed it to the delegates from the Sons of Italy. The Sons of Italy read over the humanitarian invitation and said they would consider it for next year. The refusal to accept the invitation was not a surprise, according to AIM. Historically, the Sons of Italy have been unwilling to change the name of their parade. In 2000, both sides agreed to change the parade’s name to March for Italian Pride. Ultimately, the agreement fell through and AIM temporarily stopped the procession of the parade as 150 people were arrested and released without any charges. Throughout the years, the Sons of Italy have stated that it is not only a celebration of their heritage, but a first amendment right to celebrate Columbus Day with a parade. They are steadfast in keeping the name of Columbus in their parade: “Columbus day parade will stay Columbus day,” said Dorothea Daddato, a member of Lodge 2075, a Denver chapter of the Sons of Italy. Daddato’s husband Michael, vice president of Lodge 2075, is surprised by AIM’s objection to the parade he loves. “I’m almost 72 years old and I’ve never seen this before. 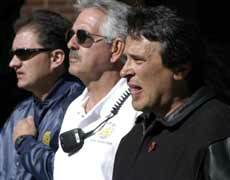 People are getting ridiculous about it,” he said. UCD Political Science Chair Glenn Morris spoke about the implications of the First Amendment right in the Confronting Racism seminar Thursday on Auraria campus. He cited the recent Supreme Court ruling in the case of Virginia v. Black, outlawing the practice of cross burning. “Such speech creates…a climate of fear, intimidation, harassment and psychological suffering that further limits and undermines the ability of those groups to exercise their rights as citizens,” writes Mark Cohen, a community organizer with AIM. Discussing the cultural impacts on the Native American community, UCD professor and co-chair of AIM, Ward Churchill, stated that the protestation of Columbus Day is not to create a sense of healing for American Indian, but to “create the possibility of healing.” He said that this possibility cannot become a reality as long as the Columbus Day parade is allowed to continue.